If you’re looking for a spiralizer that will serve all your needs, try this one from Paderno. It has four different blades for cutting a variety of thicknesses, from as thin as angel hair to wide ribbons. This model cuts the entire vegetable, so there’s no “core” removed from the center. The coreless cutting is great for vegetables that don’t have an undesirable core, like carrots, beets, or young zucchini, but it’s not as great for fruits with a seedy core, like apples or cucumbers that have a soft core that might not cut well. The blades store under the spiralizer and the entire unit folds up for storage in one compact box. This makes it a great choice for kitchens that are short on space as well. Since this is a hand-crank unit, it takes a little bit of effort and a little practice to get the right rhythm to produce uniform noodles, but it’s not strenuous work. This unit is dishwasher safe, but also easy to clean by hand. If you want to spend a bit less, this spiralizer from OXO is a great choice. It includes blades for small and larger “noodles” as well as a blade for wide ribbons. When cutting, a small “core” of the fruit or vegetable is left uncut, which is great when it’s desirable to discard the core. If that center is usable, you can still cut it with a knife or set it aside for another recipe. The blades store in a separate case which attaches to the spiralizer for storage. The blades are different bright colors, for ease in telling them apart, and let’s face it, it’s just more fun than an all-white gadget. For stable cutting, this has one large suction cup on the bottom that attaches firmly to smooth countertops. This unit is dishwasher safe, but also easy to clean by hand, using a small brush to clean the blades. While this spiralizer might look a little odd, it has three different sections for small and large noodles as well as ribbon-style cutting all in one unit. There is also a pusher to keep fingers away from the blades, and it comes with a y-shaped vegetable peeler, as well. Rather than cutting the face of the fruits and vegetables, this spiralizer works like a giant pencil sharpener, leaving behind a pointed nub of vegetable when you can no longer push and turn it into the device. This is dishwasher safe, but also includes a small brush for easy hand-washing. If you’re not sure you’ll love spiralizing, it makes sense to start with a modestly priced tool. This one comes with two blades, so you can cut either ribbons or spirals, and it’s just about foolproof. Just insert the vegetable in the top and twist the pusher. This design leaves a lot less uncut vegetable bits than some other spiralizer designs, and it also keeps your fingers safely away from the sharp blades during use. For storage, both blades fit inside the spiralizer, so you won’t have loose parts to keep track of. All parts are dishwasher safe. If you’ll be spiralizing large quantities of everything in sight, this attachment to KitchenAid stand mixers can take most of the work out of the task. It includes three spiralizing blades and three ribbon or slicing blades in different thicknesses, as well as a peeling blade so you can peel and cut produce at the same time—or just peel, if that’s all you need. Since it’s powered by the mixer, there’s not much effort required aside from putting fruits and vegetables onto the unit. When cutting, a small “core” of the fruit or vegetable is left uncut. The blades are dishwasher safe; the body should be wiped down by hand. For a slightly lower price, there is a unit that includes just two spiralizer blades and two ribbon blades, along with the peeler. If you’ve already purchased the four-blade unit, you can purchase the two thinnest blades separately. This spiralizer comes in a box to help organize and store all the pieces safely. 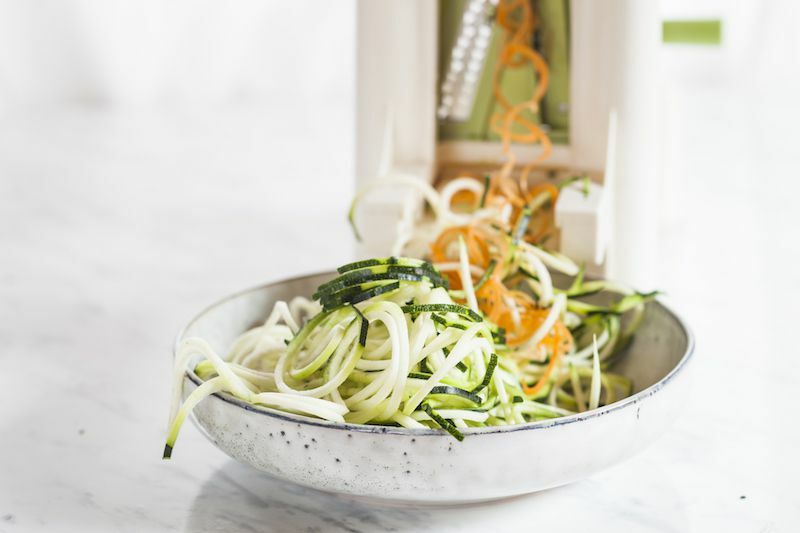 If you want to use spiralized vegetables as salad ingredients or as a garnish rather than making them a regular part of the main course, this little hand-held spiralizer can make quick work of a zucchini or cucumber. If you’re planning on spiralizing a family’s worth of zoodles for dinner on a regular basis, it could get a little tedious cutting that much by hand all the time. Since it’s small, this gadget stores easily. The blades are recessed into a cup-like section, and there’s a handle that grips the food, so fingers can stay safely away from the blades during use, and the handle acts as a cap for the spiralizer during storage, keeping the pieces together and the blades protected. This has one spiralizing blade, but there are pricier versions that come with two or three blades if you want to upgrade. It’s dishwasher safe, but easy to clean by hand. For those with kids who like to help out in the kitchen, this spiralizer is one of the safest since the cutting mechanism is fully enclosed during operation. It also has an attached container for catching the fruit or vegetable noodles once they’ve been spiralized. It cuts the entire vegetable with no center core. There are only two cutting options, with spiralizing blades on one side of the cutting surface, and a ribbon-cutting blade on the opposite side of the cutting surface. 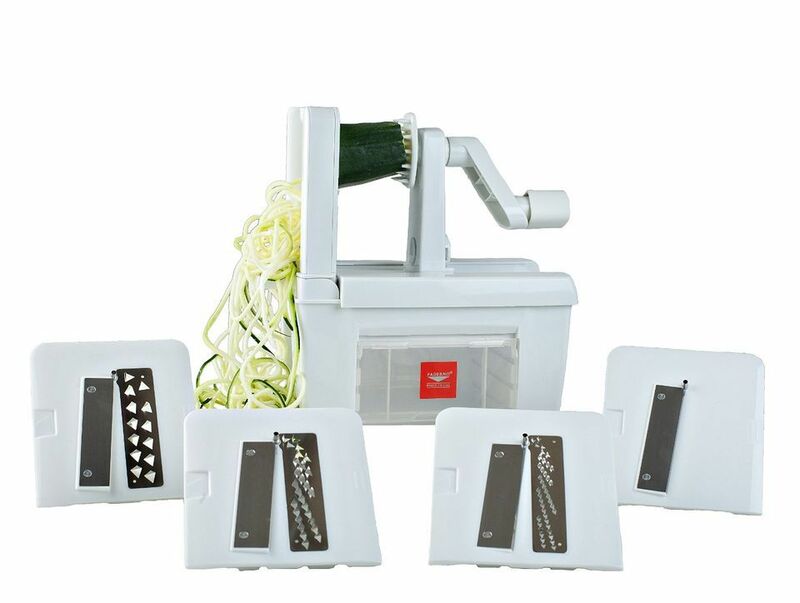 It’s not as versatile as other units that come with multiple blades, but it’s fine for making zoodles if that’s all you’re interested in, and it can be stored fully assembled, so there are no loose parts to lose. Vegetables need to be cut to about 3 1/2 inches long prior to spiralizing to fit into the cutting area and positioned properly for optimal cutting. And since the container isn’t huge, it might need to be emptied several times if you’re planning on slicing a lot of vegetables. The top can be a little fiddly to attach properly, so this isn’t a unit younger kids could use completely unsupervised. The unit is dishwasher safe, but easy to wash by hand.